Costs – See what homeowners in Hamilton, ON have paid for tree maintenance and removal. Compare against what you might pay for the same services. FAQs – Considering new trees for your backyard? Be sure you know about the tree culture in Hamilton before you buy one and have them planted. Services – Need to call a pro today? Look at our list of pros near you. How Much Do Tree Services Cost in Hamilton? Several factors affect the cost of tree service in Hamilton, Ontario. Trimming or removal is not always as simple as snipping excess branches or sawing down a tree; sometimes, tree growth patterns require special strategies for achieving safe removal. The type of tree is a major consideration in the cost of removal. Different tree species have varying amounts of foliage, and some have entangled roots that are more difficult to pull up. Typically, after cutting branches, removal specialists must secure the tree with rope and lower it to the ground slowly. Small trees up to about 30 feet cost from $125 to $435 to remove. Medium trees 30 to 60 feet in height range from $175 to $900. Removal for large trees 60 to 80 feet is estimated between $400 and $1,000, and trees taller than 80 feet can cost more than $1,400 to remove in Ontario. Felled wood also must be considered in the cost. Homeowners can decide to keep the wood or have it hauled away, but there may be additional costs for cutting and splitting the wood. The average time for grinding a stump is about two hours. If the stump has to be removed completely and a tree service team has to dig under the ground to remove a root system, the rate could add up quickly. The total cost is typically $100 for the first stump and $25 for every one after that. Removal specialists work at about $3 per inch of stump diameter measured at the widest point. Trimming and pruning or simply cutting a tree down to a stump usually involves an hourly flat rate for service. Pruning allows a plant to get healthy light and water while guarding against harmful insects and diseases. Although most homeowners pay an average of about $650 for general tree maintenance services, the cost can range from $200 to $1,300. Between 80 and 90 percent of Canada’s urban forest exists in the front and back yards of residents. Although Canada is perceived to be a forest nation, 78 percent of Canadians live in urban areas. Trees still offer major gains, even in urban living areas. There are approximately 80,000 trees in Hamilton’s borders that keep the area green and healthy. The Hamilton Forestry Section seeks to preserve local greenery, so public trees must be dead or present a danger in order for removal requests to be performed. The city does not remove trees, brush or wood from private property. Determining whether trees are private depends on where the tree is located. If a homeowner plants a tree on city property, it is considered a gift to the city and can only be serviced by the city according to the Tree By-Law. Trees that the city has planted on private property will not be serviced by the city. There are overhead clearance regulations for trees planted in Hamilton. The by-law requires low-growing trees that do not reach more than 20 feet to be at least 10 feet away from overhead power lines. This does not include street lights or service lines. City law prevents any single tree species from making up more than 20 percent of all trees. The following species are no longer permitted to be planted in Hamilton: the Manitoba Maple, varieties of poplar, willow trees, the Siberian elm and female ginkgo biloba trees, which produce a lot of fruit and have a very strong, sickly smell. One of Hamilton’s oldest native trees was discovered in 1837 and found to have 560 rings counted on a stump. Hamilton also has registered trees on the Honour Roll of Ontario Trees, a list of the largest living trees of each species in the area. The city of Hamilton has made itself distinctive on that list with a speckled alder in 1976 and a downy serviceberry tree in 1979. Many types of fruit trees grow in Hamilton, including apple, apricot and cherry. Pruning fruit trees is best done in the early summer months of June and July in order to reduce vegetative growth and stop shoots. This can create a dwarfing effect for the tree, however. Midsummer pruning has little effect on stimulating growth, but this may be the ideal time to control the width and height of trees by cutting new growth. This will produce more sugars and better flavors in developing fruit. Pruning done in the fall must be carefully considered. Cuts will not heal on trees at this time. Pruning peach or nectarine trees in the fall is dangerous because it may lead to canker, a fungal disease that destroys tree bark. Tree diseases are not always fatal, but they disrupt the normal life process of the tree. Most appear with signs that are detectable to the human eye. 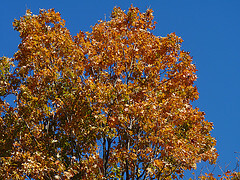 Infected trees may show leaf discoloration, shrunken leaves or spots. If the disease is detected early enough, it may be manageable through pruning or fungicide injections. If it has progressed through the tree, it may be necessary to call a professional for treatment or removal.